The chin is all about harmony. A well-defined chin gives both structure and balance to the face and helps define the facial profile. It’s also one of the most overlooked areas of the face when it comes to considering the right plastic surgery procedure. When most people look in the mirror, they tend to focus on obvious wrinkling or prominent features that look “off,” rather than the more subtle structure and effect of the chin area. It’s easy to see hooded eyes, large creases in the skin or a nose that’s out of proportion. It’s a lot harder to notice how much a “weak” or recessed chin can affect your appearance—and even how others perceive you. Just as different physical traits in different cultures around the world are tied to how men and women are perceived and treated, in America defined chins have come to symbolize strength and power. Without a naturally demarcated chin and contoured jaw, people are often perceived as being weak, whether the outward appearance matches the inner psychology or not. Chins have also become a central topic in the social fabric of our lives. A modern-day ritual for both young and old, the “selfie” has put our chins front and center—often from not-so-flattering angles. How we hold the camera, tilt our heads and capture the light on our profiles all have to do with how our close-ups look. And those defining moments, often captured and posted for all to see and comment on, put an increasingly frenzied focus on the chin. Sadly, few people understand how much the reverse camera angle required for the everyday selfie actually distorts reality, in more ways than one. If it’s not noticed during a routine selfie, an undefined chin is often ignored or not truly identified until a patient comes in for a rhinoplasty consult for surgery on the nose. At this point the size and shape of the chin becomes a serious consideration when discussing how to balance the proportions and dimensions of the nose. A weak or depressed chin can actually make the nose appear more prominent, over-projecting or overshadowing the lower half of the face. Quite often the two plastic surgeries go hand-in-hand to create the most complementary outcome possible. Another common time people consider chin augmentation, reduction or sculpting, also known as mentoplasty, is later in life when gravity has taken its toll over time and the chin in effect pulls the face downward, creating the illusion of a weak chin and jawline. If you were born with a weaker chin, time is definitely not on your side. The games gravity plays with the lower half of our faces in the second half of our lives are not fun ones. This minor plastic surgery procedure on the chin “props up” the parts we like; sculpts skin around the parts we don’t; and even exposes the natural beauty of a jawline that has become hidden under sagging skin and folds. The chin implant procedure is a relatively straightforward form of facial plastic surgery that can dramatically enhance the look of an aged face and make a significant difference in the appearance of older adults. To augment the chin, Dr. Smith first makes a few tiny incisions, typically at the chin’s natural crease line, and gently inserts a soft, synthetic implant that feels similar to natural tissue in the face. Because modern implants come in a wide variety of sizes and shapes, Dr. Smith can follow a careful outline to create the most custom fit and natural result. After implantation, nearly invisible sutures are used to close the incision, and healing time makes any minor scarring unnoticeable. In chin reduction surgery, a surgeon initiates the procedure with similar incisions and carefully sculpts the chin bones to a more proportionate size. 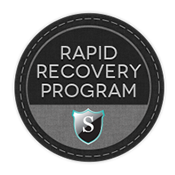 As with all the procedures at Smith Cosmetic Surgery, chin implant patients are given access to and instructions for how to take advantage of Dr. Smith’s exclusive Rapid Recovery program. The advanced, in-house healing routine includes a combination of “supercharging” hyperbaric oxygen, laser and LED-light treatments and specially formulated skincare products. 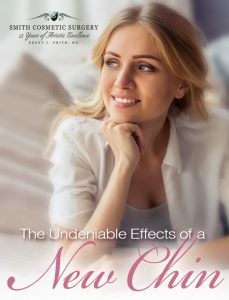 Just as all faces—noses, lips, brows, cheeks—are unique, so are the challenges that come with individual chins. Each person brings a different scenario to the table, and for Dr. Brent J. Smith that’s all part of the art of cosmetic surgery. He has perfected this precise craft over nearly three decades in the business of operating on faces, and faces alone. 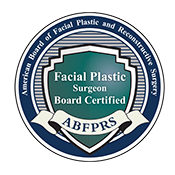 A double Board-certified surgeon, who understands not just the art but also the real science behind the structure of the face, this is where Dr. Smith shines.